Are you a horse owner? 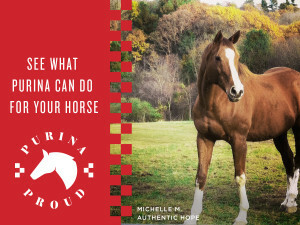 Here is a great offer to try Purina Horse feeds. New Customer Offer Sign Up: New customers can signup online to participate in the Purina Proud 60-Day Trial. Once you sign up, you will receive an email with an in-store voucher for a FREE trial kit that includes a weight tape, educational information and a Buy One, Get One FREE offer to redeem at our store. Make sure you select OUR store when you sign up! Bring us email voucher or print the email confirmation to receive the FREE trial kit. At Day 20 of the trial, new customers will receive a second Buy One, Get One FREE offer. Again, show us the email voucher or print the email confirmation and bring it to our store to receive the Day 20 offer. Frequent Buyer Card: Once you complete the Purina Proud 60-Day Trial, new customers will receive a completion kit. The completion kit includes a Frequent Buyer Card to get a 9th bag FREE once they purchase 8 bags. You can either show us the email voucher or print the email confirmation to receive the Frequent Buyer Card. This offer is valid until 9/30/16. Note: Buy One, Get One FREE vouchers are valid through 11/30/15. Already feed Purina Horse feed? Well you can get in on the action too with our referral offer! Referral Sign Up: Current customers need to sign up online to participate in the Purina Proud Refer-a-Friend program. Customers who sign up will receive a unique code via email to share with friends. You can refer up to 10 friends. Once a friend signs up for the Purina Proud 60-Day Trial, current customers will receive an email with a voucher for a Buy One, Get One FREE offer to redeem in your store. Offer valid through 11/30/15. What are you waiting for? Signup now for the Purina Product 6-Day Trial! See the difference! This entry was posted on Friday, July 24th, 2015 at 5:02 pm	and is filed under Horse, News & Updates. You can follow any responses to this entry through the RSS 2.0 feed. Both comments and pings are currently closed.